At noon I dropped my son off at day camp and headed north. My destination was Old St. Hilary's Preserve in Tiburon, but as I eased through the Golden Gate Bridge traffic I realized I'd have to alter my plans -- the north bay was overhung with haze. So instead I headed up to Rock Spring, hoping to find my two favorite summer flowers in bloom. 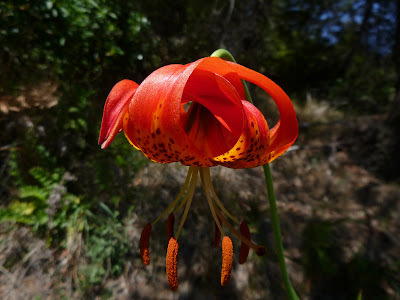 Leopard lily (Lilium pardalinum) and western azalea (Rhododendron occidentale) thrive in cool canyons along the coast. Azaleas (wild cousins of Rhododendrons) are inconspicuous most of the year, blending into mixed woods, but in late June and early July the shrubs put forth white flowers accompanied by an amazing sweet scent. When grassland is dry and brown and the woods are a universal dusty green, leopard lilies are like fireworks -- bright orange blossoms practically exploding with color. I reached Rock Spring to find a production crew staging a Honda car commercial. Trailers, craft trucks, and cars were crammed into the lot. Bored-looking CHP officers lounged in their cruisers with the AC blaring. It was hot. I squeezed into a spot at the edge of the lot and started off down Cataract Trail. My first spot to check for leopard lilies was the damp edge of a meadow, an interstitial pocket of grassland surrounded by woods. One lily was blooming. I spotted a few more still in bud further down the trail in the creekbed, as well as a handful of not-in-bloom azaleas. The search continued in vain until I gave up at Laurel Dell and headed back up Cataract (I didn't have time to make a longer loop). The trail was busy with chatty groups. Horseflies swarmed around and bit me. The way things were going I kept expecting to cross paths with a rattlesnake. Not my happiest hike. Azalea on Cataract Trail. Please bloom soon! When I picked up my son and told him about my afternoon, he commented, "Gee mom, it is summer." Oh yeah. Time to hit the lesser-known preserves near the coast. And if you see azaleas and leopard lilies, will you let me know? 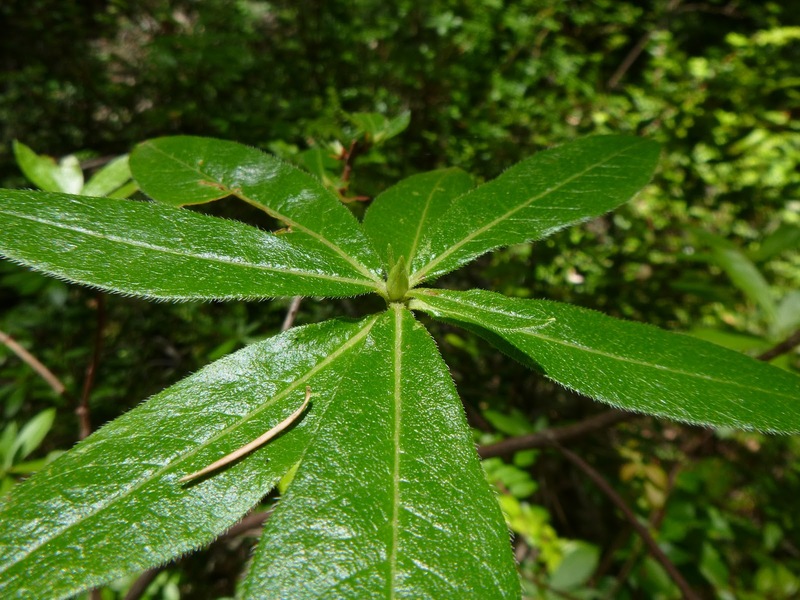 Hike your own summer flower treasure hunts on Mount Tam: I've seen azaleas in bloom in past years on Rocky Ridge Road, Cross Country Boys Trail, Kent Trail, and Cataract Trail. 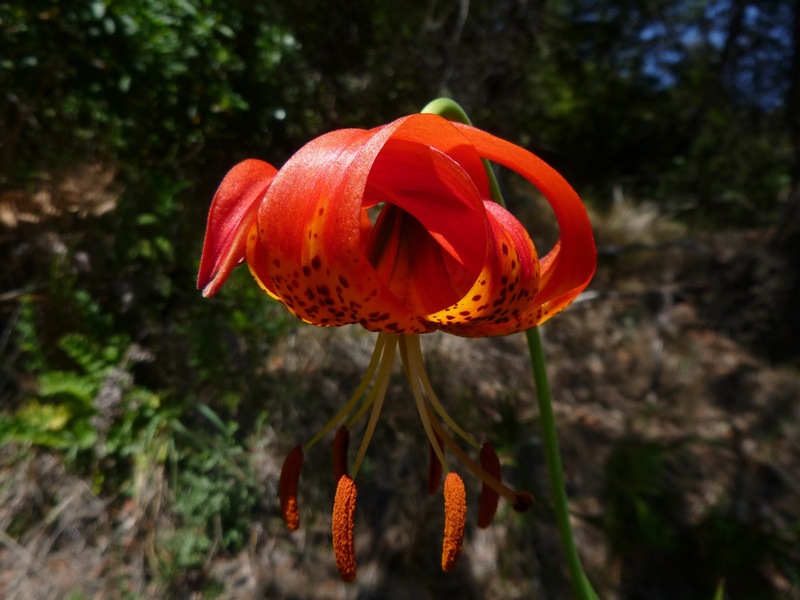 Leopard lilies have evaded me except for the lovelies on Cataract Trail (and the bunch thriving in a little seep along the side of Panoramic Highway). No doubt I've hiked past azaleas not-yet-in-bloom on many bay area trails. I have seen them in bloom in Big Basin Redwood State Park and Tomales Bay State Park. All the hikes linked here are so nice that you probably won't be crabby if you don't see azaleas and leopard lilies.